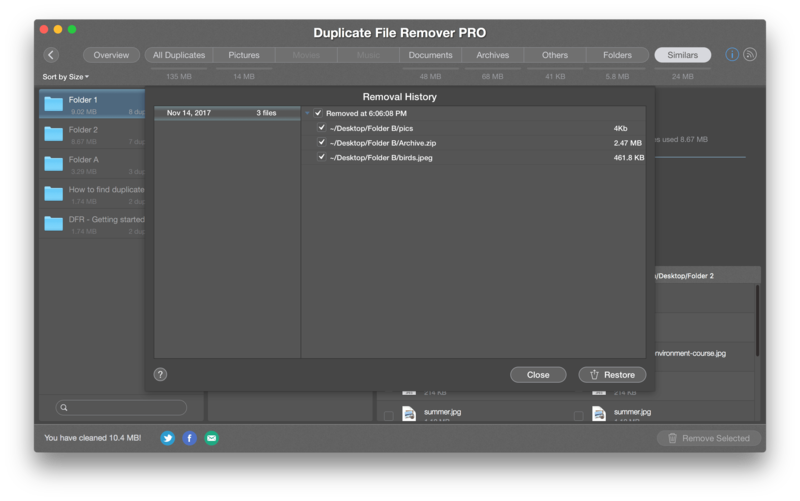 Duplicate File Remover Pro allows you to find duplicates on any disk and in any folder. Drop as many folders and drives as you want and start scanning. Enjoy the magic! 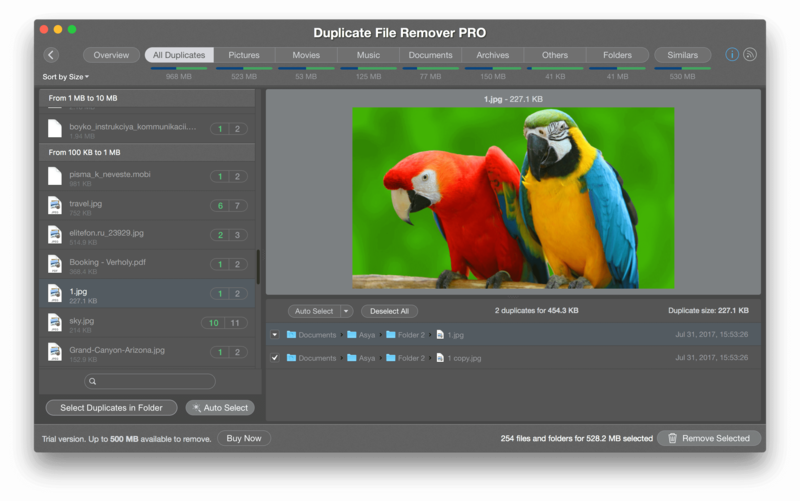 Duplicate File Remover Pro supports different file extensions. The application finds duplicate Pictures, Movies, Music, Documents, Archives and so on. Moreover, you can find Duplicate Folders as well as Similar Folders. Similars are “almost-duplicate” folders; they contain both absolutely identical and unique items. Get the visual chart report of all the duplicates found. All files are sorted by file type, so you can navigate to any category (Movies, Archives, etc.) and view a number of duplicates and their occupied size on the disk. The app also shows a list of the biggest Similar folders and provides smart Cleanup Hints to simplify your cleanup job. In each tab section, you will find duplicates of specific file types. Also, you can sort your files by name, date, number, size, age and total size. Select unneeded duplicates manually or trust the Auto Select button to select all these files with one click. Note, you can customize the Auto Select feature with Always Select and Never Select options in the Preferences. If you know exactly from what folder you want to remove duplicates, use the Select Duplicates in Folder button. After you click to Remove, the app will show you a confirmation window with the list of all the selected duplicates. 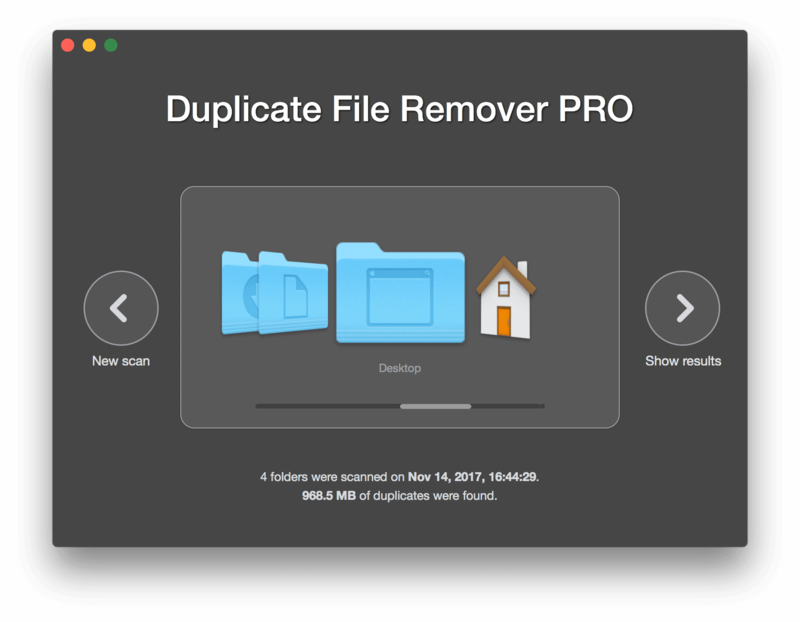 Duplicate Files Remover Pro doesn’t delete any file without your confirmation. 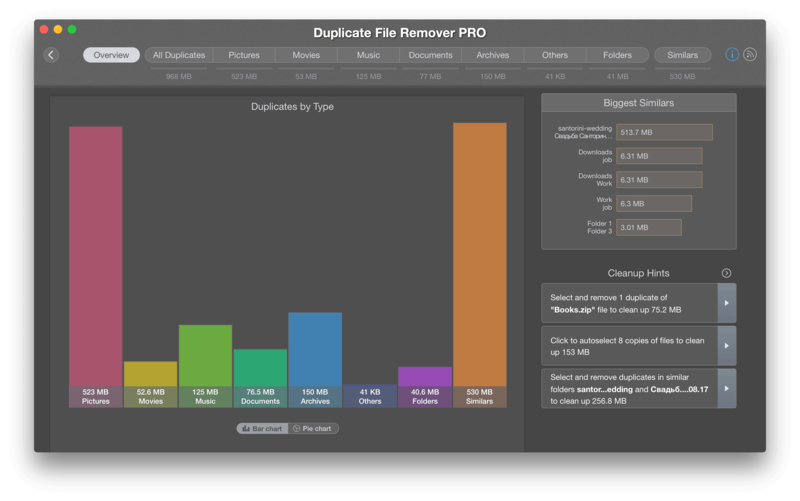 Just preview your selection and give your access to delete duplicates. Simple duplicate finders usually search for identical content only. We give you a chance to find folders containing both similar and unique content. 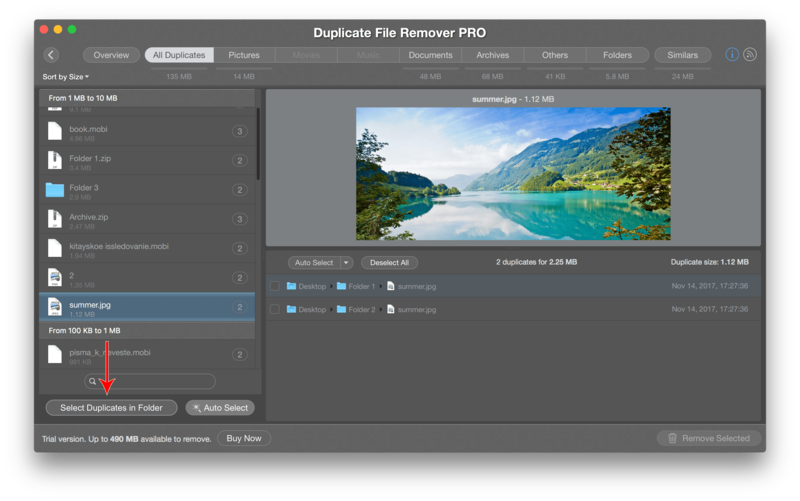 Try this feature and you’ll fall in love with our Duplicate File Remover Pro forever. 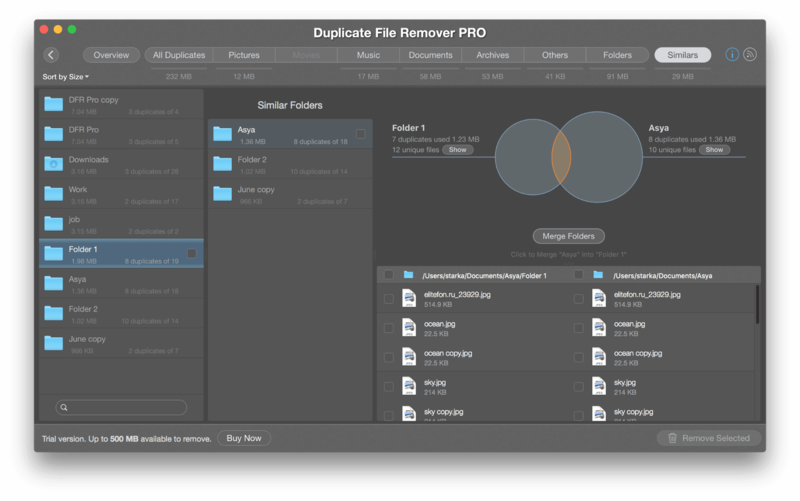 We know how long it may take to preview and select each duplicate file separately. So we’ve created a stunning feature to simplify your job. 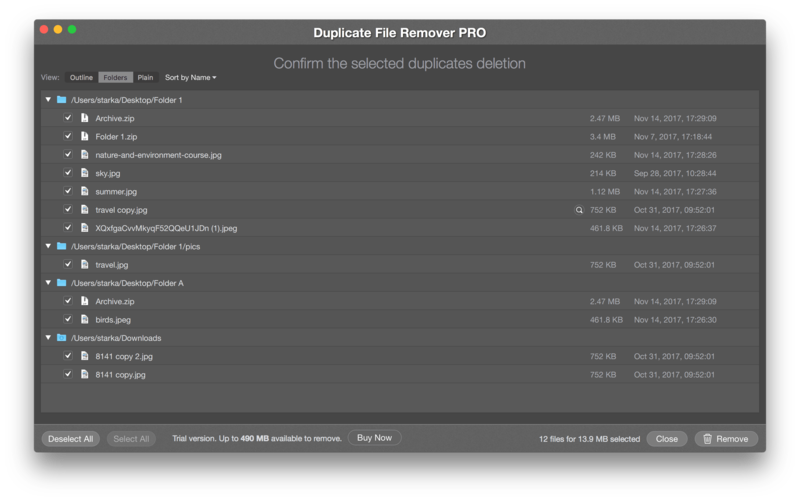 Use the Select Duplicates in Folder to quickly choose from which folders you want to remove duplicate files. 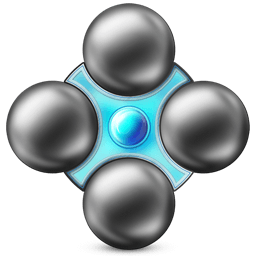 Believe us, the duplicate cleanup process has never been faster and easier than now. Even if you removed important files, you can always restore them with the app. 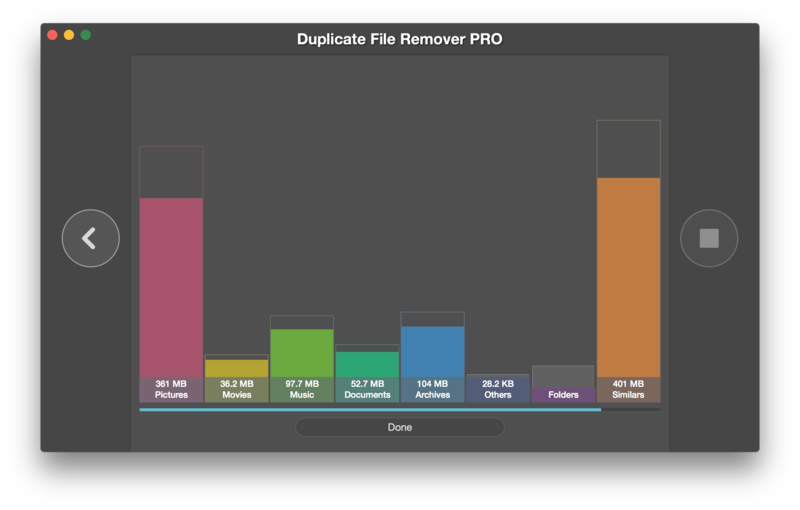 Duplicate File Finder Pro allows you to clean up your Mac from useless files quickly but safely!